My great Aunt would bake us one of these decadent Austrian tortes for our birthday’s, and every time I make one it brings me back to growing up in Colorado. Make sure to splurge on the jam, it will make a difference. This recipe uses almond and hazelnut meal, if you do not have them you can grind whole or slivered almonds and hazelnuts in a food processor until it is a fine consistency. The fresh ground almonds and hazelnuts adds a lot of flavor to this decadent dessert. We used a cast iron skillet instead of a tart pan to make our Linzer Torte but either can work. AN Your favorite jam, we used raspberry. Place the roasted hazelnuts and almonds into a food processor and pulse until coarse, then add the AKI AP Flour^GF and pulse until you can get the nuts to a fine consistency. It is okay if the mixture is slightly coarse. Place butter and sugar in a bowl and cream together. Add the spices and to the creamed sugar and butter followed by one egg. Mix until incorporated then add the other egg and mix again until incorporated. Add the flour blend and mix until a uniform dough has formed. The dough should be fairly tacky, scrape the dough out of the bowl and onto a sheet of plastic wrap and roll it up. Store in the fridge until you are ready to use. When ready to make the torte, preheat oven to 350°F. Remove the dough from the fridge and plastic then cut a piece of the dough off. Dust the counter top with AKI AP Flour^GF and roll the piece of dough out to 1/4″ thickness. Place the dough in the tart pan or cast iron skillet and press it into any grooves. If baking in a skillet you want the dough to come up the sides about 3/4″. Place the jam on top of the dough, about 6oz, again that all depends on what type of vessel you are using to bake it in. Typically you want the same amount of filling as you have dough on the bottom. in this case about 1/4″. Roll out smaller pieces of dough and cut the lattices and place them on top of the jam. Place the skillet into the oven and bake until the jam is starting to bubble out of the gaps and the crust is golden. You will want the crust to be a little on the darker side to ensure the jam has set. Once cooled you can remove the torte from its vessel and place on a cooling rack until ready to serve, best to let cool on the rack for a few hours and even better after a few days. The Northeast is full of apples and when my fiancee came home with a dozen or so freshly picked apples from a field trip at school, I knew it was time to get another great gluten-free recipe together. 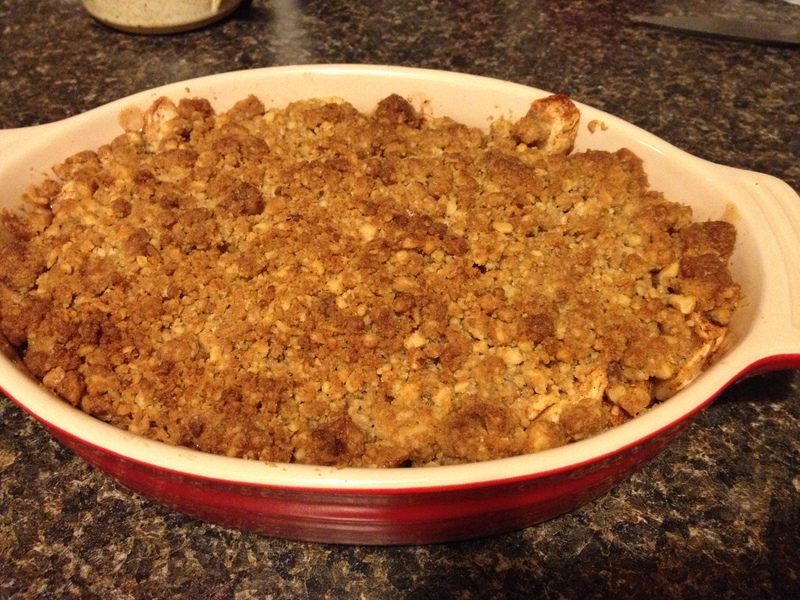 This apple crisp is great for the holidays and even better in the summer when berries in the Northwest are a plentiful.